I love this film and the experience I had seeing it. 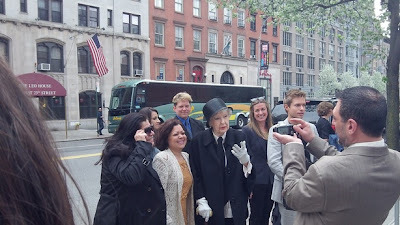 It is one of my best Tribeca memories ever. To be honest my feelings for the film are tied to the screening which makes a great film even better. The film is a portrait of actress Elaine Stritch today. Following Stritch as she reflects on her life of 87 plus years and prepares for a concert run. Its a film that is filled with he friends talking about her and most importantly it has the lady in action tearing up the place and taking names. Its a joy to behold. Most interesting is the film is a warts and all portrait of Stritch. We watch her in good times and bad, and there is bad as the diabetes and age begin to take it's toll on the great lady of the American theater. We watch as her blood sugar goes up and down, how her memory comes and goes, and how she is sometimes hospitalized. As they say growing old ain't for sissies but Stritch is a trooper who marches on. I love that we see Stritch's troubles since it makes her force of nature personality even more human. When the film was done I wanted to go across the aisle (I sat a row or two behind her and across the aisle) and give her a bear hug. Now- as any one who reads Unseen already knows my experience with Ms Stritch began before the screening. As Randi and I arrived at the theater we watched as the great one dealt with her public who wanted pictures and autographs. She handled it all with grace until she was pulled along by the festival handlers. I snapped some photos of her on the red carpet before we went inside. For me watching the lady and the film had an extra significance that only a few can understand. 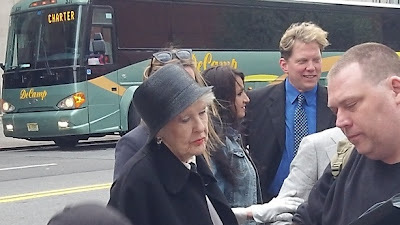 When we first saw Stritch outside Randi remarked at how she looked and acted like my mom. And I kind of saw it. Then when the film started and I saw her going through things like my mom did with her diabetes I was deeply moved. Watching the events on the screen were eerie reminders of some of the last year or so with my mom. At times it wasn't a great actress but my mommy up there and I was moved to face things I haven't dealt with since my mom passed away. Thankfully things turned around quickly as Ms Stritch would say or do something outrageous (just like my mom) and the tears would stop flowing as I was busy laughing. I'm telling you this for a simple reason, namely to prove how good the film is. 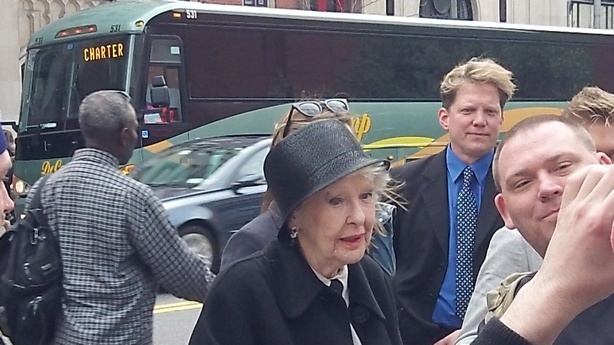 Simply put even if I hadn't gotten to see Ms Stritch in person, and crack wise with her, and even if it hadn't touched me because of my mom, I still would have loved the film. It is simply put one of the best of Tribeca and one of the best of the year. Go see it.